896, FireWire audio interface from MOTU in the 896 series. This Fire Wire interface was used to replace our PCI set up that we had. It was a lot easy to use and better for use to use this interface than use the one we were using. The MOTU 896 changed a lot of my views on Fire Wire interfaces, at first I was not really liking them because was use to using the regular PCI interfaces. The MOTU 896 is a pretty big unit and will take up 2 rack spaces. But it does support sample rates up to 96 kHz with 24 Bits. Also you can use your FireWire to “daisy chain” one 896 to another one if you need more inputs for your recordings. 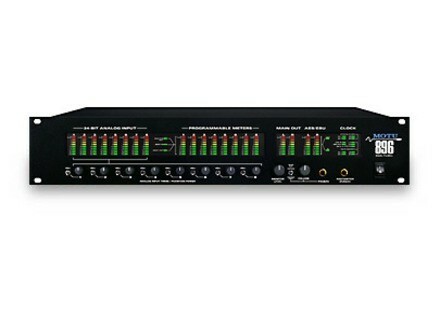 The MOTU 896 seems to be a monster when it comes to microphone plug ins and usability. The 896 is the upgraded version of the 828, which came out in the 90’s if I am correct and the 896 came out in around 2001-2002. The unit itself is very well build and is made to take a massive beating. I don’t see this thing every failing on anyone because of its size and well built framing. Keep aware that its not portable at all, so you will need to live it in the rack space. it’s a pretty permanent interface. I have used the 896 by MOTU on my computer running over 300Mhz and had no problem, syncing and hooking up the interface to your computer couldn’t be any easier. Latency is almost zero and I have used this in almost any software you can think of that was out in the early 2000’s. Most machines just aren't built like this anymore. No compatibility issues and it worked great. I wish all gear now a days was as well built as it use to be. When we had this the manual was not our concern. I don’t even remember seeing one now that I look back. Overall, I haven’t seen many interfaces that are as well built as the MOTU 896 was back in 2002. I was very confident that the unit could last a lifetime. We sold ours, but I am sure whoever got it is probably still using it. One of a kind interface!